Drum and Tote Oven eliminates need to use band heaters. Electrically heated with precision via digital temperature controlÂ and over-temperature control, Sahara Hot Box Model E4 heatsÂ 4 drums or one tote onÂ pallet. Air circulation blower ensures temperature uniformity and acceleratedÂ drum heating. Offering alternative to band heaters, this system is built to withstand harsh industrial environments and features completely welded panels, heavy-duty hinges, and heavy gauge steel. Max temperature is 350Â°F, and multiple options are available. Benko Products, Inc., a leading innovator in industrial ovens, is pleased to announce that its Sahara Hot Box Model E4 eliminates the need to use band heaters. 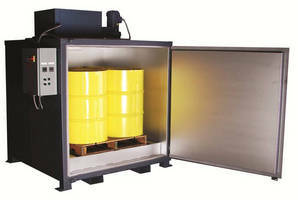 The Sahara Hot Box Model E4 heats four drums or one tote on a pallet, and is electrically heated with precise, digital temperature control and over-temperature control. The unit features an air circulation blower for temperature uniformity and fast heat-up of drums. Sahara Hot Boxes provide a convenient and cost effective alternative to traditional band heaters which are material handling intensive, burn out frequently and can easily degrade temperature sensitive materials. The Sahara Hot Box Model E4 can withstand any harsh industrial environment due to its unique design and robust construction. It features completely welded panels, has heavy-duty hinges and heavy gauge steel, making it ideal to survive forklift abuse and drum impact. The Sahara Hot Box Model E4 features all steel construction with a temperature range to 350°F. The unit is shipped completely assembled. Options include a 6” vent with damper, interior door latch, an outdoor use package, chart recorder, door switch and adjustable timer. Benko Products has been manufacturing Sahara Hot Boxes for more than 30 years and have thousands of ovens successfully operating in the field today. A two-year warranty is offered, as well. For more information on Sahara Hot Boxes, contact Benko Products, Inc. at (440) 934-2180 or go to www.benkoproducts.com. Benko Products, Inc. is a privately held company based out of Sheffield Village, OH. Benko Products was founded in 1983 by pioneer John Benko, the inventor of the Sahara Hot Box® drum warming oven. Benko’s leading product lines also include industrial batch ovens; G-RAFF safety platforms; mezzanine safety gates and chemical storage systems. Benko is also the parent company to GREEN Access & Fall Protection, a leading manufacturer of gangways for tank trucks and railcars, as well as self-leveling stair applications.